Crann ‘Trees for Ireland’ is a Membership based organisation set up to raise awareness of the environmental importance of trees, hedgerows and woodland. Changes to the Woodland Improvement Scheme (WIS) to introduce grant aid to carry out a second thinning intervention for broadleaf forests. NATIONAL TREE WEEK 2019 March 31st TO April 7th 2019! A BIG Thank You to everyone who supported and celebrated the various National Tree Week events nationwide! REMEMBER: GET OUT THERE AND ENJOY ALL THAT IS WONDERFUL AND FREE – IT IS YOUR NATURAL HERITAGE!!! We were honoured and delighted to have our Patron, President Michael D. Higgins, launch our latest tree planting initiative, in partnership with Birr Castle, on 21st April 2017 – the Giants Grove Project. 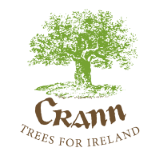 Crann 'Trees for Ireland' was formed in 1986 with the aim of Releafing Ireland. Crann is Ireland's leading voluntary tree organisation dedicated to planting, promoting,protecting and increasing awareness about trees and woodlands. Crann publish Crann magazine for all its members, full of fascinating articles about trees, wildlife and the environment. Crann is Irish for "tree" and it's all about the trees. Inside we have a database on trees found in Ireland, plus lots of other useful information for the tree lover out there. JOIN US TODAY AND START MAKING A DIFFERENCE!